REVELATIONS, Terry James’ new novel, has gotten off to a good start. We thank you for making it one of the top new releases in fiction in Kindle! We hope you will recommend the story to many of your friends. This will help greatly with the book’s momentum while we strive to get out the prophetic Word in fashion that fiction readers will pick up and read. Although fiction, it represents Truth from God’s Word and can be most effective in disseminating information about things to come. Also, we ask that you write reviews on Amazon.com The greater the number of positive reviews, the more widely spread will be the prophetic Message that Jesus is coming again –perhaps very soon! “I’m not sure the rest of us would agree with you,'” Tyce said, glancing toward Marial, who conversed with the others. Greyson paused to reflect on the network executive’s query. “No. Don’t worry. let’s just get on with filming the documentary. The suspense and intrigue will build. This was the best thing that could happen for the promotion of the series,” Bressnick said. Marial looked out the helicopter’s window, seeing the Aegean sprawl 14,000 feet below. Spiney ridges of the small Cyclades chain protruded from the cobalt blueness like the humps of a gigantic sea serpent. “Patmos is that larger one, there,” Tyce said loud enough to be heard over the thumping of the helicopter. He leaned near her to point to a large mass of gray jutting from the Aegean. “Well, the people were praying in the vision last night, weren’t they” she said, leaning against his arm and laying her face against his shoulder. Her warmth somehow calmed his uncertainty about the prediction –about the trip to the strange cavern where it all began. Stravos’ broadly beaming smile greeted them when the huge blades stopped turning and they walked down the steps from the helicopter’s doorway. The small Greek waved to get Greyson’s attention. Stravos grabbed the journalist’s hand and shook it vigorously with both hands. “Any flight in which you get back down safely is a good one,” Tyce said, returning the Greek’s smile. Stravos smile widened even more, his attention turning to the woman at Greyson’s side when he was introduced to her. “She your woman?” Stravos said, continuing to smile and hold her hand. “Ah! Yes…Welcome to Patmos,” Stravos said, seemingly oblivious to her words. The Greek said nothing, but smiled while looking down while they walked and nodding his head, obviously pleased at what he heard. “Have you been up to the cave yet?” Tyce said while they rode in Stravos’ van that moved along the rough road ahead of the truck. “Yes. We have made certain the serpents are not there,” the Greek said, matter-of-factly. “Yes, that is good,” Marial said with enthusiastic agreement. Tyce sat on the stone of the flat stone below the larger slab of natural formation. He looked out the cave opening, down the mountainside to the long, gray-brown beach. The Aegean lay beyond for as far as could be visually determined. He alternately, between times of looking at the Mediterranean vista, read the script held in his hands. He would have to memorize only a small portion –for moments during the filming when the cameras were on him. The rest he would read as narrative to be the voice over for the many intriguing shots the film crews hoped to capture. But, he reminded himself, he must always read the voice over portions with the same, conversational cadence and tone as when on camera. “We’re about ready to do a test or two,” one of the crew said from near the small entrance to the upper cave room. “I’m about ready, too,” Greyson responded, looking in the direction of the man. His eyes went automatically to the ledge above the cave opening. The ledge where the snake had latched onto his hand. Marial’s face appeared in the opening. There was anxiety in her voice. “What?…What’s happened,” he said, hurrying to duck, then follow her through the opening when she retreated. “It’s Bressnick,” she said, handing him the satellite phone. 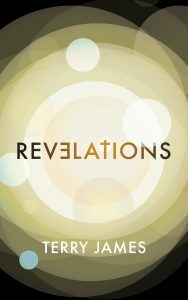 Get your copy of REVELATIONS by Terry James today!